Ian exploring a few of the rocks off the shore of Cape Kiwanda. He got his pants completely wet while going out there. Cape Kiwanda is located near Pacific City, Oregon and it’s the third of the Three Capes Scenic Route that also includes Cape Meares and Cape Lookout. (Check out our blog post about visiting those two parks here!) We began our trip to Cape Kiwanda by climbing the massive white sand dune. It’s tiring to climb up the 240 foot dune, but from the top of the dune, you can see the crashing cobalt waves up and a sea stack called Haystack Rock about a half mile from shore. To the south you can see Nestucca Bay protected by a natural breakwater. The Cape Kiwanda Dune is the highest dune on the Oregon Coast. The sandy beach at Cape Kiwanda stretches on a long ways. The entire Oregon Coast is public land, so you can stroll as far as you want. From the dune, you can walk out to the park’s sandstone cliffs. The cliffs have been carved by the waves and in many places they are overhanging or have strange hooks and crannies where the waves create thudding sounds as they crash into them. The cliffs are very unstable, so you can’t walk on them. In fact nine people have died on the cliffs since 2009—that’s more than have died from falling from the Half Dome Cables in recent years. The combination of the crumbling sandstone and the powerful surf is deadly, so only view the cliffs from a respectful distance. Besides the dunes and the cliffs, Cape Kiwanda has a sandy white beach. The beach is the launching site for the Pacific Dory Fleet. These small but fast boats land by driving straight at the shore and beaching themselves. Looking to the North from Cape Kiwanda, over more sandstone and sand dunes. The sandstone cliffs of Cape Kiwanda are fragile and the surf is powerful. All of the Oregon Coast is publicly owned and Cape Kiwanda is an especially beautiful stretch of this public treasure. It was a little cold for swimming while we were there, but we did see an old dog having the time of its life out in the waves and even body surfing back to shore on his belly. We walked a long way down the white sands, and we enjoyed exploring the tidal pools around the rocks by the shore. Haystack Rock has protected the soft sandstone cliffs of Cape Kiwanda from wave action while other areas have eroded completely. Ian looks out at Haystack Rock and windswept trees from the top of the sand dune. Pacific City is an adorable ocean side village—with lots of cute shops and places to eat. If you need a great place to eat breakfast before hitting the beach or the trail, check out the Grateful Bread Bakery. I enjoyed a delicious, crumbly marionberry scone and black coffee, but Ian ordered a Western omelet and I had terrible food envy. The ham inside the omelet was so delicious! The café is sunny and spacious and has surprisingly little Grateful Dead memorabilia. Only 11 miles down the coast from Pacific City is the Cascade Head Scenic Research Area. 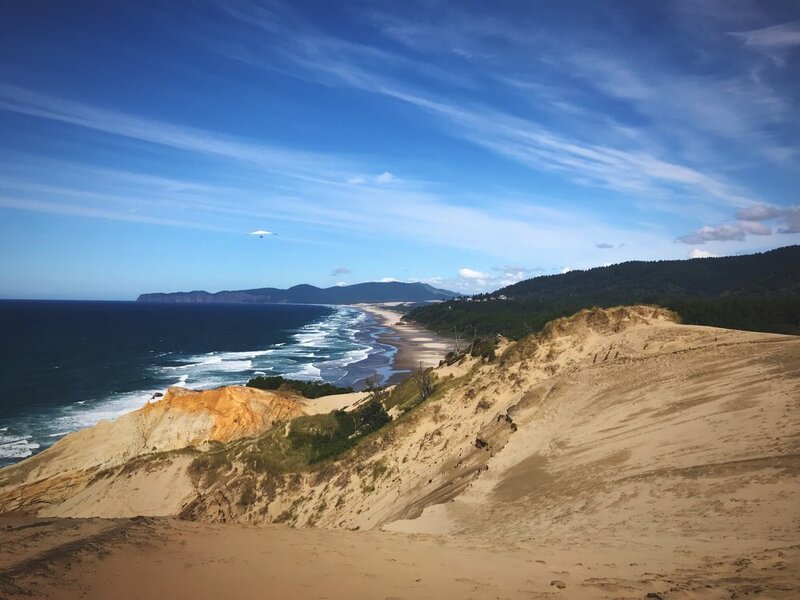 Established in 1974, the area is part of the Siuslaw National Forest and it was the first non-wilderness area to be protected by congress. Today the area is a Unesco Biosphere Reserve with areas for ecological restoration, outdoor recreation, and an experimental forest. The Harts Cove trail goes through an area of coastal rain forest. It’s got an great surface for running. We did a trail run on the Harts Cove trail, but this was the perfect place to stop for a rest. We decided to explore Cascade Head with a trail run on the Hart’s Cove Trail. The trail switchbacks down through a lush green coastal forest. The woods are carpeted with ferns and towering Sitka spruce and Douglas fir shade the trail. The surface of the trail is mossy and covered with pine needles. Along the path you’ll hear the bark of sea lions in an unseen cove. The path descends steeply for the first half mile, and then it rolls over more gradual hills until it opens upon a meadow that overlooks the ocean at 2.5 miles. Make sure to look down on the left side of the meadow. There is a small cove below with black rocks with green waves crashing against them. The view is framed by pines, and it’s a great spot to rest and listen to sounds of the ocean. We could hear sea lions barking in the next cove over, but we never saw any on this run. The meadow at the end of the Harts Cove Trail is an example of coastal prairie…who even knew there was such a thing! Free Camping Nearby: We camped about 4 miles north of the Hart’s Cove Trailhead at the Winema Wayside. It’s a lovely little overlook along the Oregon Coast Highway with an interpretive kiosk and really beautiful views of the ocean below. The highway quiets down at night, so this spot was surprisingly peaceful for a wayside. The sunset from here was incredible. We ate dinner while watching the sky transform from teal to orange to pink. There are many such waysides and overlooks along Highway 101, and we spent the night at quite a few during our Oregon Coast road trip. Just make sure there are no signs prohibiting camping at any pull-off before parking for the night. We experienced a beautiful sunset from the Winema Wayside. Waysides aren’t usually great spots to spend the night, but this one was actually pretty quiet.